“It obeys me!” he said. That fascination never left him, and as Alix grew older his natural talent and intense compulsion to draw, paint and sculpt led his family to encourage and support his obsession. Growing up first in the Champs de Mars area as a quiet and shy youth attending the nearby St. Louis de Gonzague, he developed a timid temperament under the strict discipline of the Catholic school. Forever drawing, he would wander over to nearby markets and fill sheet after sheet of paper with sketches inspired by Haiti’s cacophonous street life. At just 14 he began studying at the Centre D’art, an institute in Port au Prince that introduced the world to Haiti’s profoundly original art and supported local artists’ development in technical skill. At the Centre D’Art Alix nurtured his abilities under the mentorship of Haitian art luminaries like Luce Turnier, Maurice Borno and Lucien Price who marveled at his talent for drawing and quick acquisition of painting skills. The time he spent there, along with the freedom and encouragement from his mentors opened up Alix’s spirit and he grew up to become what friends described as a charming, funny and caring man. He was constantly seeking inspiration in places where he could sit unnoticed for hours, spending endless days in Marché Darbonne until all the vendors knew him on sight, a figure that became part of the background like the broad trees he would later paint a series of. Although best known for his acrylic paintings, Alix never thought of himself as a painter, but rather a “Cinéaste”, capturing stories and activity, as though his drawings and paintings fit together as a giant storyboard for the film of Haitian life. The oldest of eight siblings, his childhood was filled with elaborate games that would become the inspiration for many of his best-known paintings. His father, also Alix, would join in the games or lead the siblings and neighborhood friends, as many as 25 children, on weekend picnics. 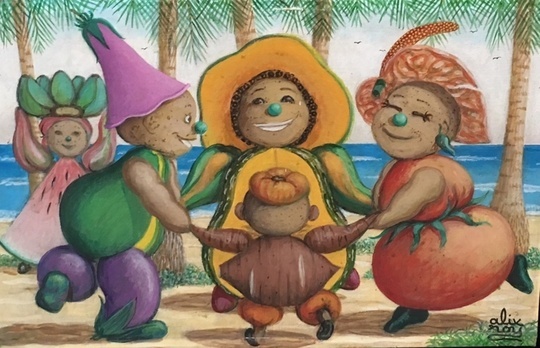 Those experiences inspired a series of paintings depicting children dressed up in adult costumes, and playful constructions of clowns or faces with various features formed by tropical fruit such as avocados and bananas. As an adult Alix spent nearly 18 years abroad, living in variously in New York and Puerto Rico. 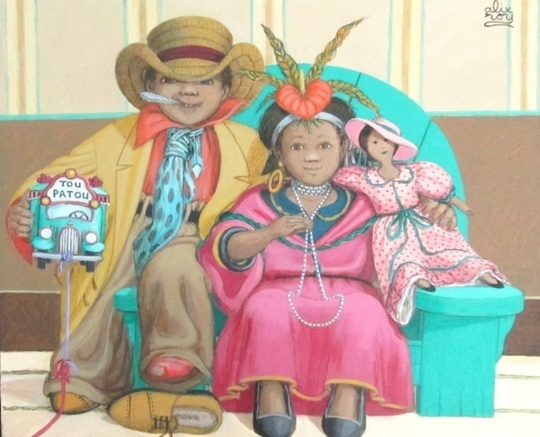 In Puerto Rico he produced art including Papier-Maché and paintings for a few exhibitions, and worked as a magazine illustrator and art authenticator in New York while perfecting his painting technique. In 1978, he told his sister he was returning to Haiti because, as he put it, “There is no inspiration here”. Preferring a simpler life, when Alix returned to Haiti he settled in Petit-Goave, a port town an hour south-west of Port au Prince. Intensely private, he produced continuously but avoided exhibitions, preferring instead to sell through an intermediary to local galleries, and spent most of his earnings supporting the neediest members of the community. Partly as a result, though many of his paintings and drawings depict his siblings, a broad search of the family archives yielded just one photo of a young and intently gazing Alix, an amused and perhaps playful expression cast across his face like the light streaming in from a window. Portrait of Alix Roy, undated. His devotion to his art and caring for those in need was unbounded, yet so absorbed was he by his art, often his family had to remind him to eat properly. Alix was not at all withdrawn, but rather so deeply and genuinely interested by the world around him that he forgot himself, able to forget lunch simply sitting the garden studying a plant or bird for hours. He was also known for refusing to negotiate prices of his work; the first offer was the last, which he explained thus — “I must pay for the food to feed the poor who come here to eat each day” His sister recalled one of his last visits in 2009 “He was such a kind and funny man; when he laughed he would laugh with his whole body, so that his feet would lift off the ground”. Alix Roy was living in downtown Port au Prince on January 12, 2010, and on that day his house and entire neighborhood were stirred back into the earth of the city, the buildings and walls merged and altered into a new landscape. His final resting place is there somewhere, absorbed into a city with a changed architecture but the same vibrant, colorful life that Alix Roy had found so inspiring he could never put his pencil down.